Essential composition, surprising and innovative. “The fundamental concept, the idea that underpins this kitchen, is to conceal it using two elements, because the kitchen, in contrast, is always full of so many objects: hiding it by means of wooden shelves and white storage units. To create greater space, for a particular visual impression: to create something different from other kitchens, basically. We called it Qi, which means bowl or container in Japanese, but also wood. So the Qi concept describes both the white storage unit and the wooden shelves: in a single word." 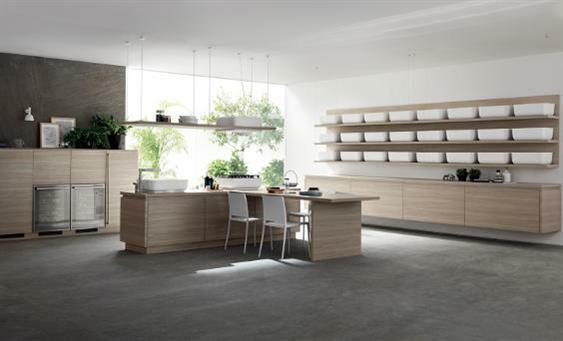 Composition with island featuring Hono Elm decorative melamine doors, Hono Elm laminate wall cladding and shelves. For perfect coordination of the environment, wall cladding and shelves can be matched with the Hono Elm decorative melamine of the wall-mounted base units (120 cm wide). A winning solution, in aesthetic terms, in open-space situations. © 2016 Skyline Services (North West) LLP.